On Wednesday, the Philadelphia Eagles signed the first of their 13 draft picks by coming to terms on a four-year contract with running back Charles Scott. Scott was the 30th overall pick (200th) in the sixth-round of the 2010 NFL Draft. The deal has reported by a league source to be worth $1.88 million with a $90,000 signing bonus. Scott is a power back, which the Eagles have not really possessed in Andy Reid's era as the Eagles head coach. 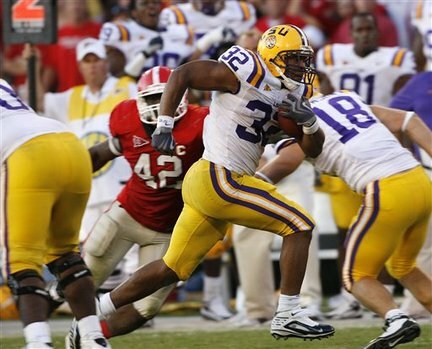 At 5-foot-11 and 237 pounds, Scott piled up 2,317 yards and 32 touchdowns at LSU. His best season came during his junior campaign as he earned first-team all-SEC honors. During his junior season, he accumulated 1,174 yards and 18 touchdowns in just 13 games. However, he took a step back in his senior season due to a fractured right clavicle. Still, Scott lead the team with 542 rushing yards and four touchdowns while missing the final four games of the year. Scott gives the Eagles another weapon in the red-zone with his bulldozer running style. It is going to be very hard for teams to stop him once he gets his legs going. Additionally, he can pick up the short yards, which have haunted the Eagles over the past couple of years. CALL THE POLICE! CALL THE FBI! SOMEBODY STOLE CHARLES SCOTT FOR A 7TH ROUND PICK! You guy's have no idea what you've got in Philly with this kid. SEC - fastest CFB conference in the nation. Check him out in the open field.